Brigid Carr presenting her poster during the Tuesday evening poster session of GoMOSES. 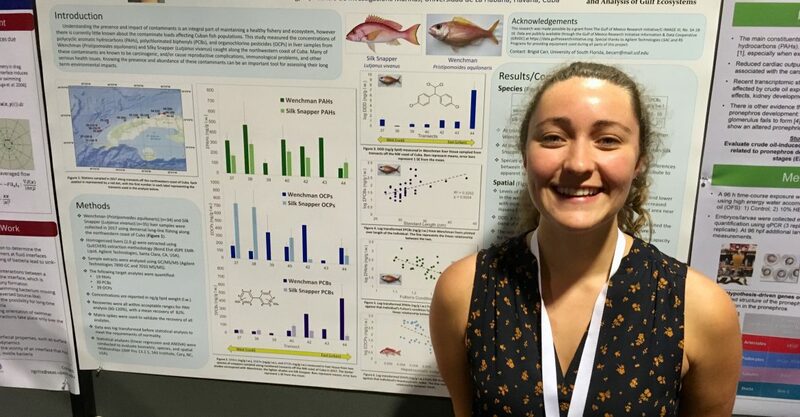 NEW ORLEANS, LA – Brigid Carr, a Master’s student at USFCMS and a collaborator in the C-IMAGE group, found an interesting trend in the data from an oceanographic cruise that sampled demersal fish (those that live and feed near the seafloor) along the northwest coast of Cuba. Concentrations of polychlorinated biphenyls (PCBs) in liver samples taken from Snapper showed a decrease in PCBs with greater distance from Havana, a major port for oil tankers and other shipping vessels. PCBs found in the liver indicates chronic exposure. Checking the liver reveals long term build up of toxins, as opposed to fish bile, which can reveal short-term, acute exposure to toxins.